It’s nearly impossible to describe what I felt when I first set eyes on Ginnie Springs and believe me; I’ve typed thousands of words while trying. 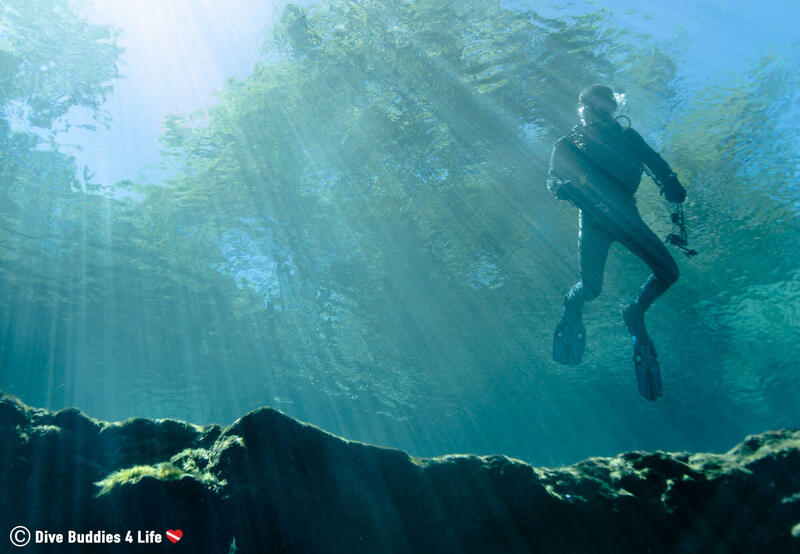 From the moment I put my mask on and ducked below the glassy surface of Ginnie Springs, I opened myself up to a whole new world of diving. It was like walking into a closet and ending up in Narnia. That world was the dark and dangerous world of cave diving. 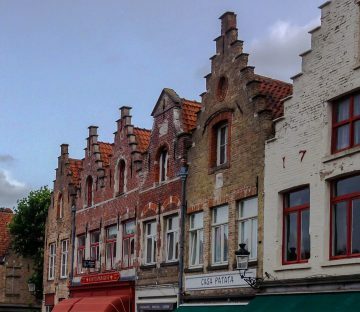 But first, let me tell you a little about the region itself. 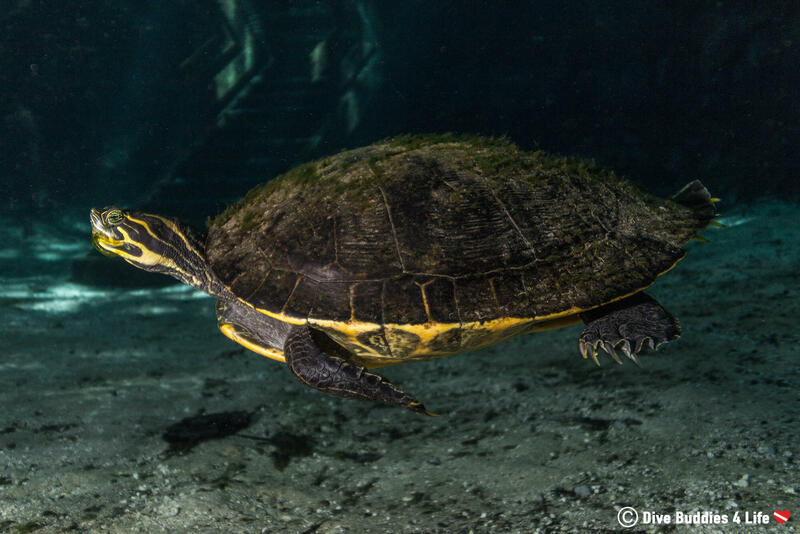 Ginnie Springs Outdoors is a year-round outdoor nature park nestled along the banks of the Santa Fe River in High Springs, Florida. 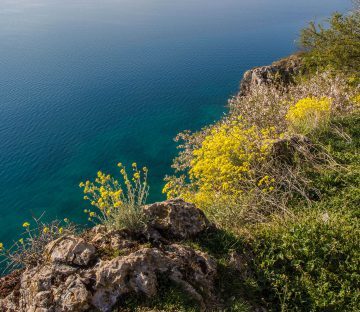 With 250 acres of forested area, camping, walking trails and of course diving opportunities, anyone could guess this neck of the woods see’s a significant bit of tourism traffic year round. Visitors can check Ginnie Springs Outdoors on a day pass at 14 USD, or camp in the designated camping area of the park for just over 22 USD. In terms of diving in the park itself, of the 5 different springs (Deer Spring, Twin Spring, Dogwood Spring, Ginnie Spring and Devils Spring System) only Ginnie and Devils allow divers permission to enter the water. 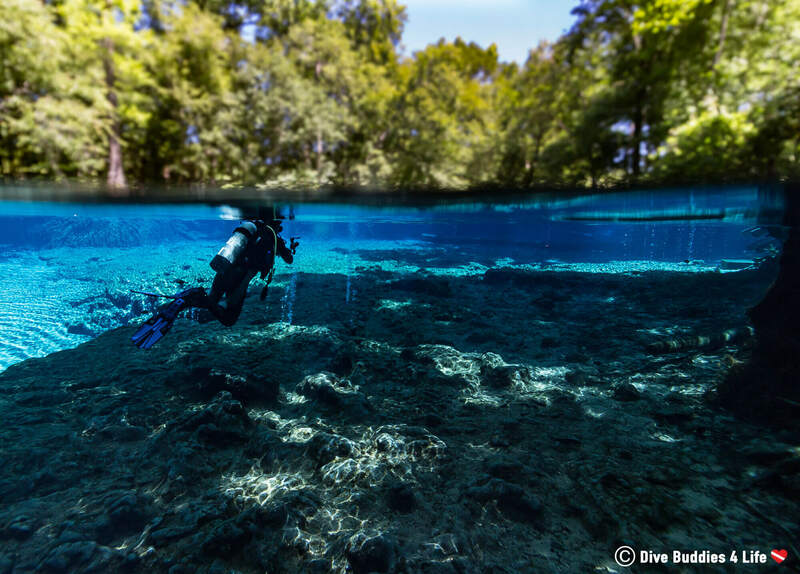 While both springs have something different to offer dive wise; Ginnie Springs is definitely a fan favorite thanks to it’s impeccably clear 72 degree water and ease of accessibility for non-cave divers – making it one of the most well known springs in the state of Florida. We began our dive day with an hour drive, from our accommodation in Micanopy to the Ginnie Springs Outdoor park. Upon arrival at the park, we quickly dealt with all the administrative duties and followed the park map to the dive site. We found the scuba spot in no time, and were greeted by a big “Ginnie Springs” sign which Joey and I felt compelled to take a picture with. 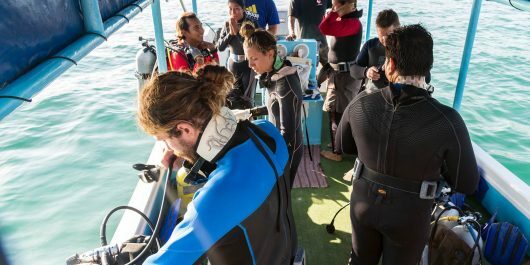 The preparation area was practically at the water’s edge and very dive friendly. There were nice washroom and shower facilities, tonnes of space and picnic tables galore on which we could throw our gear. Being one of the only people at Ginnie we had our pick of the lot! After scouting the spring basin from the shoreline and preparing our gear lickedy split, we made our way to one of the many stairs giving divers easy access to the water. Three, two, one… I descended the stairs into the crystal clear water and pushed off from the wooden platform bobbing like a cork as I readied myself for submersion. The water rose to my chin, then past my nose and eyes filling my field of vision. Soon I was completely submerged, the sound of my breathing amplified in my ears. As I peered down into the water, I could see that the mainspring was pretty shallow, looking to be only 15 feet deep. My first impression of this freshwater dive site was one of utter awe. In spite of the storm and rain that had passed the night before, I quickly understood how, even on a bad day, the visibility at Ginnie Springs was spectacular. I could see far into the distance, the color almost too intense to be true. 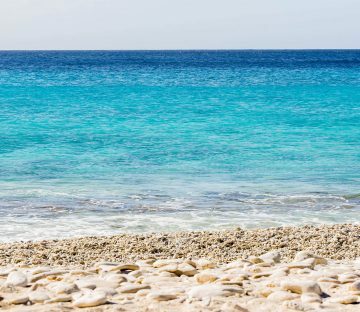 Fine white sands, toppled over tree trunks, clumps of rocks and every single shade of blue on the color wheel. It felt like I had stepped into an alien world. Wasting no time, or air, our main priority was to head into the well-known cave and leave the lagoon exploring for the end part of our dive. Joey was the first to discover the gaping entrance to the famous cave called the Ginnie Ballroom. 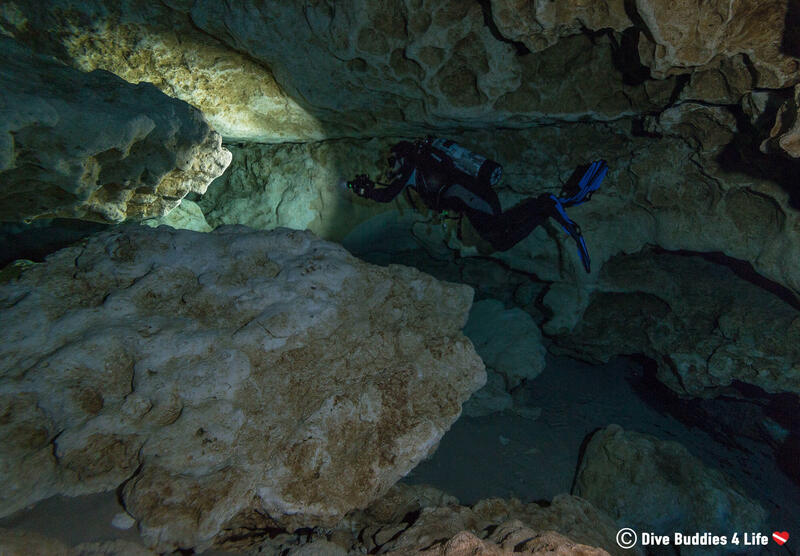 Interesting Fact: The Ginnie Spring cavern is among a handful of sites that dive experts consider sufficiently safe for non-cave/cavern divers to explore. Certified divers of all experience levels can bring their own lights and check out this underwater wonder. Without further adieu, we gently kicked our fins towards the wide open cavern entrance found at the bottom of the basin. Being careful not to disturb the bottom, we glided past the smiling opening and into the belly. As much as the upper portion of the cave was illuminated by natural sunlight the inside wasn’t. In going from bright to dark, our eyes took some time to adjust to the dimly lit cave. Joey turned on his camera lights and followed behind me down the heavy duty guideline into jet-black darkness. Slow but steadily we descended passing the 30-foot mark and then the 40. It didn’t take a rocket scientist to realize when we had arrived in the Ginnie “Ballroom.” I caught my breath, marveling at the astonishing size and beauty of this amphitheater size cave. The sheer dome size of the cave, which looked to be approximately 40 feet in diameter, made Joey look small and seemingly insignificant amid the rock formations. Looking up, I watched my exhaled air bubbles expanding and bursting the roof of the cave. Such unusual geological formations! The limestone above my head looked precisely like swiss cheese, yellowy-white with holey pockets of air. I later learned that a lot of this rock work and geology is pretty unique to Floridan Aquifer. After taking the time to enjoy some of the Ballrooms rock features, we headed down towards the very back of the cave where a large metal grate met us. 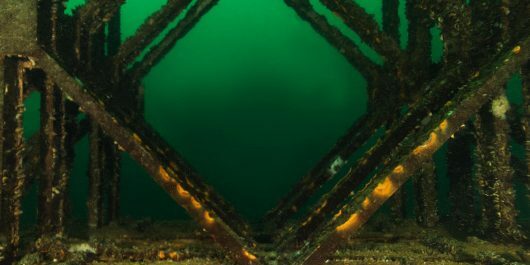 At 50 feet deep, this grate is put in place to prevent divers from entering the dangerous Ginnie cave system that lies beyond. Curious to feel the steady flow of water forcing its way from the underground Floridan aquifer, we pulled ourselves up to the welded grate and pressed our faces into the current for a minute or two. At 35 million gallons of water per day passing through that opening, man was that spring water strong! As we turned and let the current push us back towards the entrance, I enjoyed my safety stop and a front row seat to one of the best views of the dive. Don’t believe me, see for yourself. Looking out from the darkness of the cave into the azure blue basin was like stepping away from reality and into a fairytale. The natural beauty of the highly reflective limestone, patches of sand bejeweled by algae, the water that was so clear you could hardly even tell it was there. It was enough to make any diver salivate. 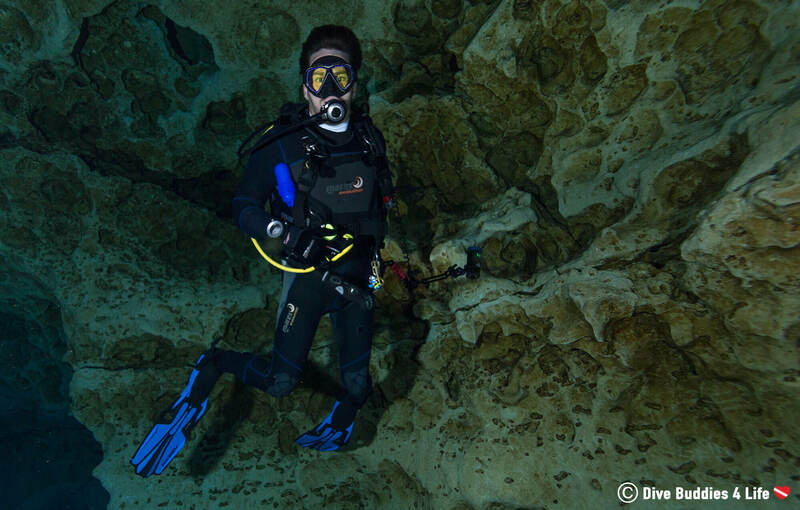 Our next dive stop was the nearby Devil’s Spring System, one of the largest and most frequently-dove cave sites in Florida. 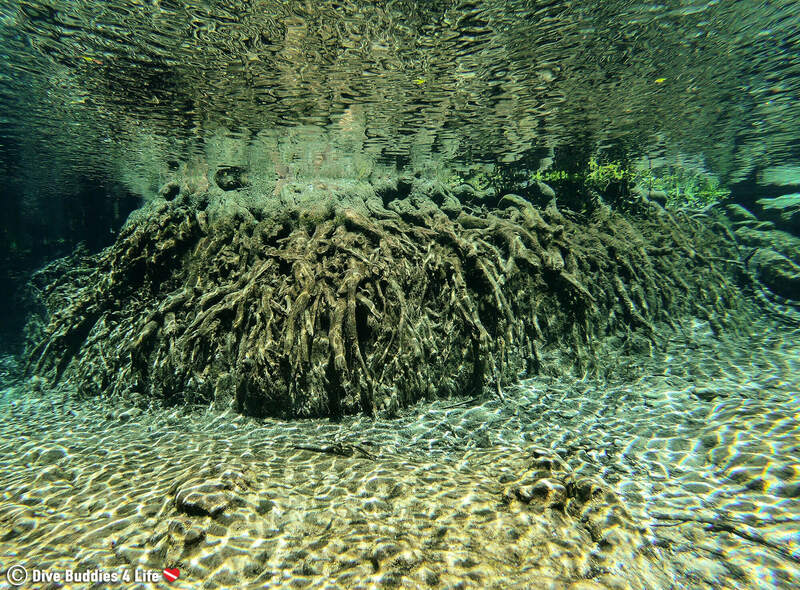 The Devil’s Spring System is a series of three separate springs, all located within 100 meters of each other. 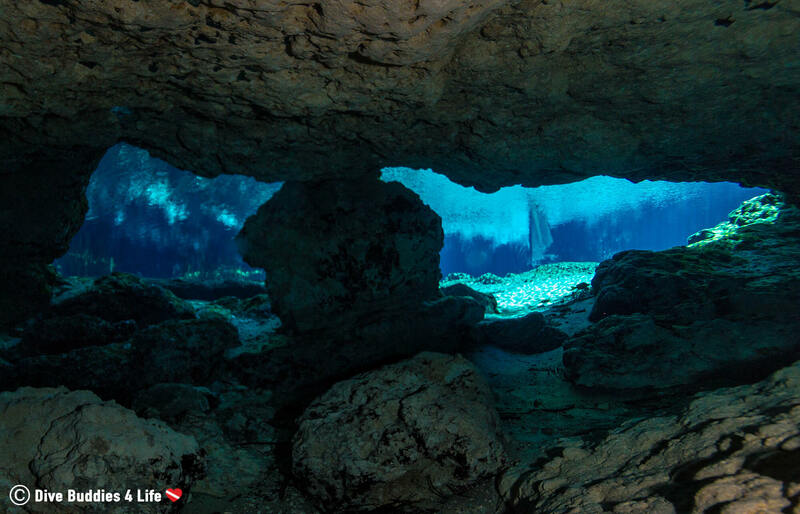 Known first and foremost as a cave diving site, the Devil’s Eye, Devil’s Ear and Devil’s Spring (also known as Little Devil) together, produce close to 80 million gallons of water per day. Having spent the better part of an hour exploring Ginnie Springs, we didn’t last too long at the Devil’s Spring Caves. It’s not that it was a boring dive site, no there was plenty to investigate, but for non-cave certified divers like us, we were pretty limited in what we could do. We began dive number two, opting to work our way from the base of the spring outwards towards the Santa Fe River. The first site was Little Devil, which mostly looked like a massive crack in the rocky base of the spring. Here, we watched as a free diver weaved his way down and around the rocks, deep into the bottom of the cave. Next up was the Devil’s eye, a cylindrical depression in the ground with a cave entrance fractured into the wall. In this part of the spring, painted turtles seemed to be the theme. It seemed that everywhere I turned my mask, the dark shell of a swimming turtle seemed to catch my attention. For a turtle lover like me, it had me grinning ear-to-ear. Check out my up-close encounters with some of these ninja turtles! As much as we wanted to peak in the Devil’s eye caves and explore as far as the natural light would allow, there was a magazine photoshoot going on during the time we were there. Deciding not to disturb the tech divers who were hard at work, we tried to stay away from the Devil’s Eye entrance. It was neat, however, to watch a group of pretty elite divers, swim in and out of the cave, packed to the brim with more dive gear than they could almost carry. I imagine it was almost like watching the Everest mules lugging supplies and equipment back and forth to Base Camp. Important Information: There is a strict and readily enforced NO LIGHT rule for diving the Devil’s Spring System. 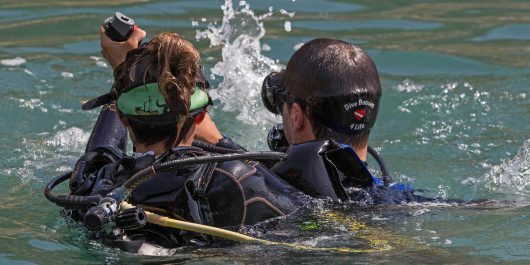 This regulation is put in place to prevent untrained cave divers from getting into areas where they lack training, experience, and equipment. 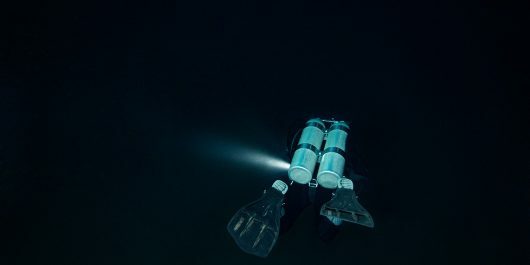 Only certified cave divers can enter the water with dive lights, this includes video and camera lights. 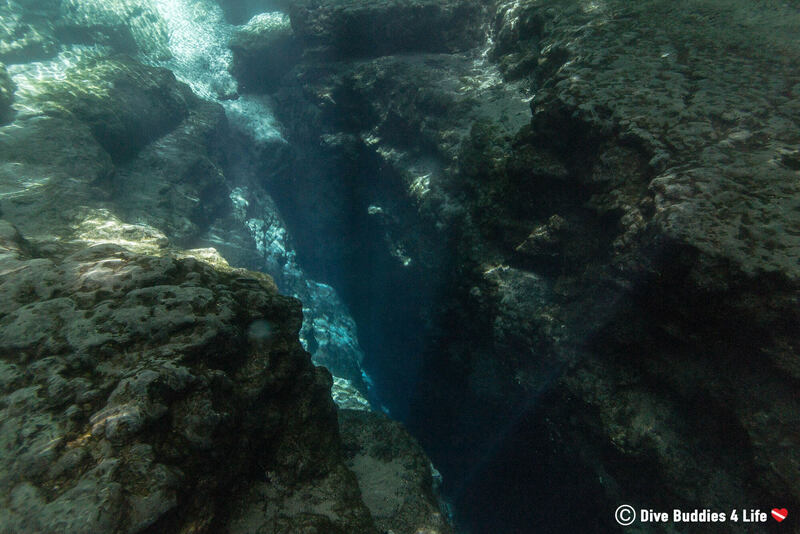 The last dive stop on our Devil’s Spring System tour was the Devil’s Ear. This site, we decided to observe from a distance because of low visibility in the Santa Fe River from a recent storm. Instead of going out into the murky river, we swam and hung around the tarped off area where the crystal clear spring meets the rusty colored river. To spend the last few minutes of our dive watching these two dramatically different bodies of water, coexist side by side, brought out the inner science geek in me. It was pretty surreal hanging in the balance of this segregating like-effect. In case you couldn’t tell, we ended our dive day on a high. Joey and I didn’t know what to expect from a freshwater dive site, and this place had more than delivered. 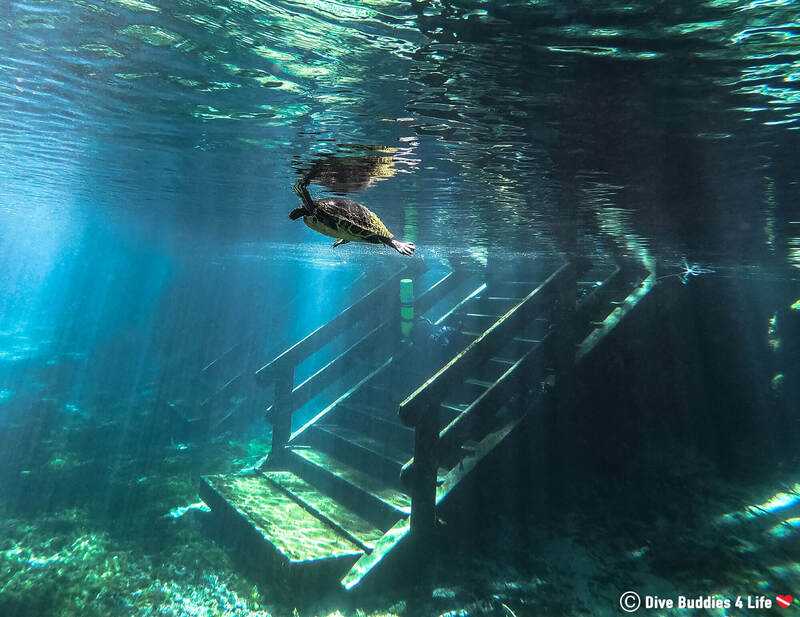 In just over 4 hours Ginnie Springs Outdoor had captured our hearts and our imagination. 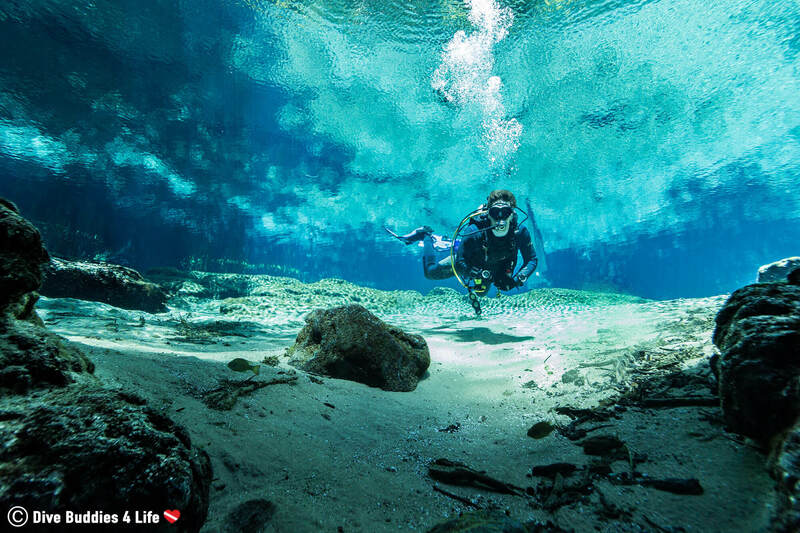 Who is Ginnie Springs dive site perfect for? 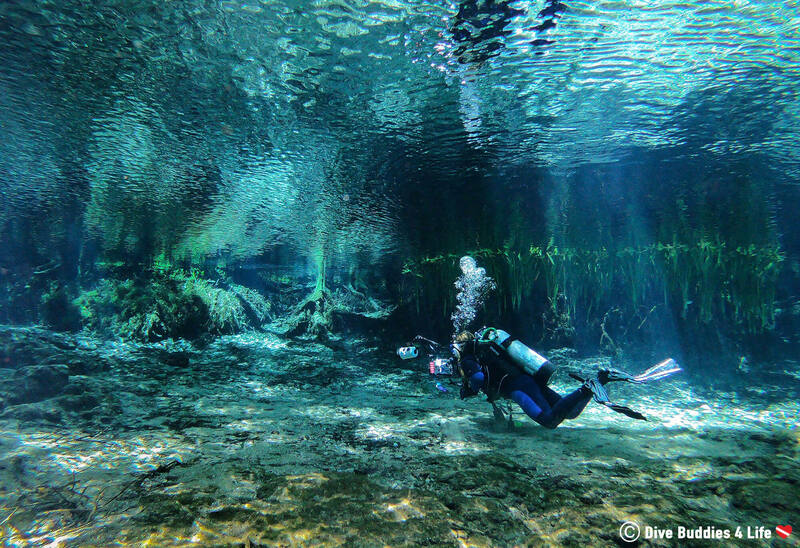 Photographers, videographers, explorers and cave divers will find themselves more than at home at Ginnie Springs. 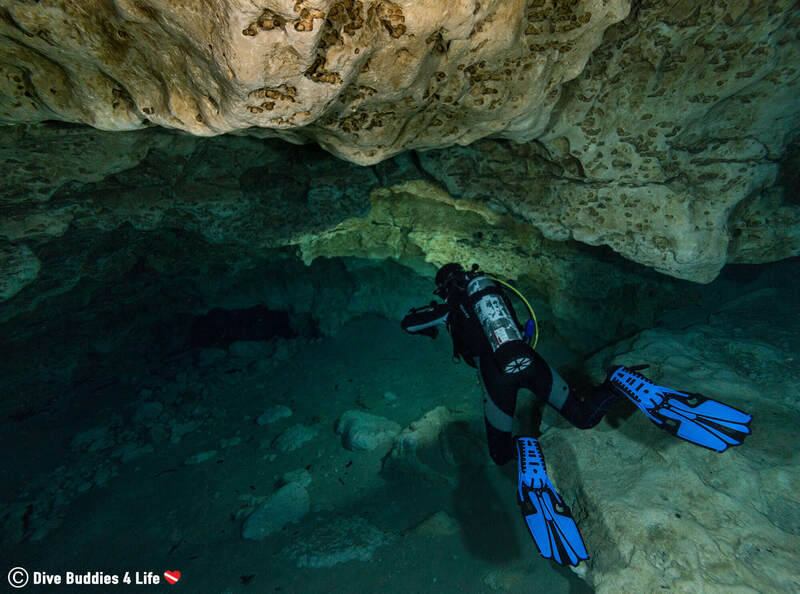 On top of that, Ginnie Springs is also a fantastic place for scuba enthusiasts looking for an amazing place to dive, or for those who might be interested in dipping their toes into the world of cave diving. 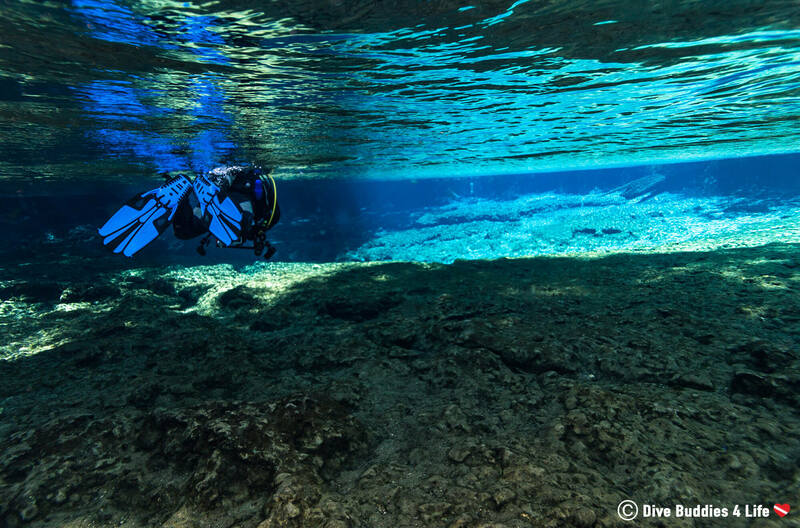 Surely now you get the picture, Ginnie Springs is a big place for scuba divers, but if you insist on visiting without your dive gear, there is plenty to do whether your a scuba diver or not. Ginnie Springs Outdoors is not only a dive site but a wilderness park with camping availability. If you like to rough it, bring your tent or trailer and set up camp on one of the wilderness or electrical sites. 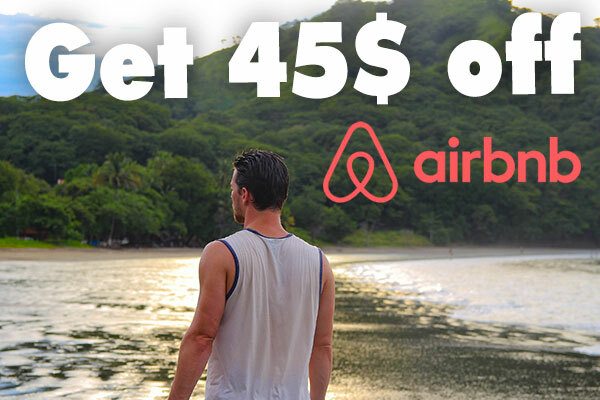 For those without camping material, the park also has rental cottages for overnight guests (175 USD/ night for four adults). During the day indulge in some picnicking, swimming, canoeing, kayaking or volleyball. The park even has inflatable tubes for rent that visitors can take river tubing down the flowing Santa Fe River. Ginnie Springs, for a freshwater dive site you have taken me completely by surprise. 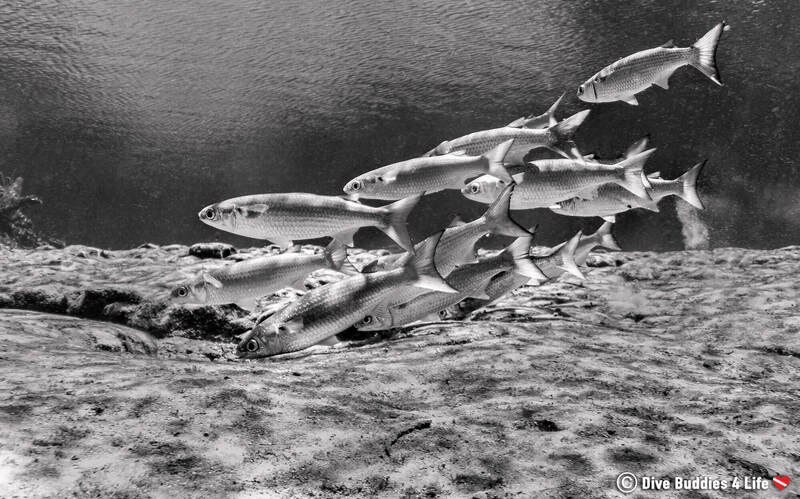 If you asked me yesterday to pick between saltwater diving and freshwater diving – I would pick salt every time. 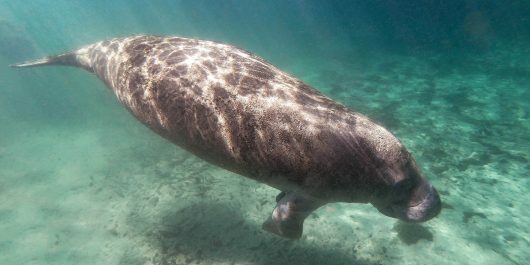 But now – after my encounter with Florida’s famous Ginnie Springs – I really don’t know what I’d tell you. I would never have imagined that I could enjoy such a shallow and creatureless dive this much. It goes without saying that this spot is hands down the best freshwater dive site I have ever been to. Ginnie Springs, you can bet your fins that we’ll be back, and next time we’ll have our cave diving certification. Until we meet again my freshwater friend! 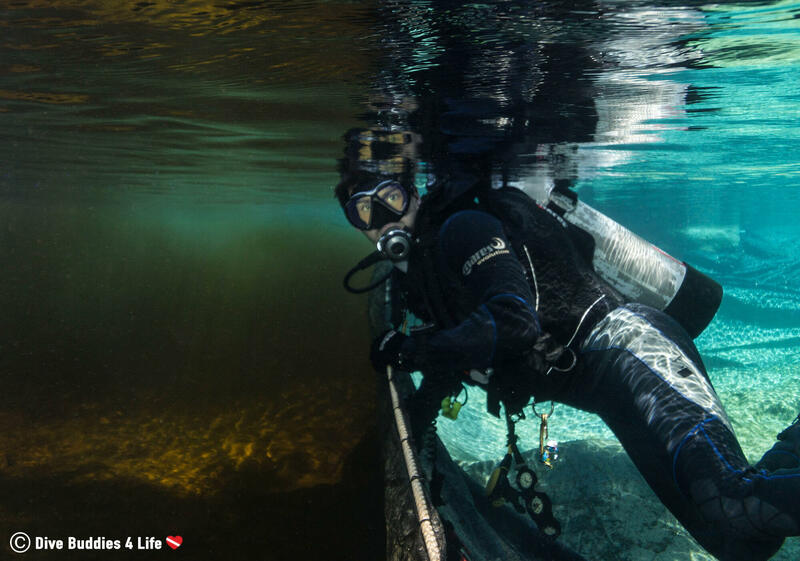 If you’ve been to the sunshine state, what is your favorite freshwater diving site? Would you dive it again? 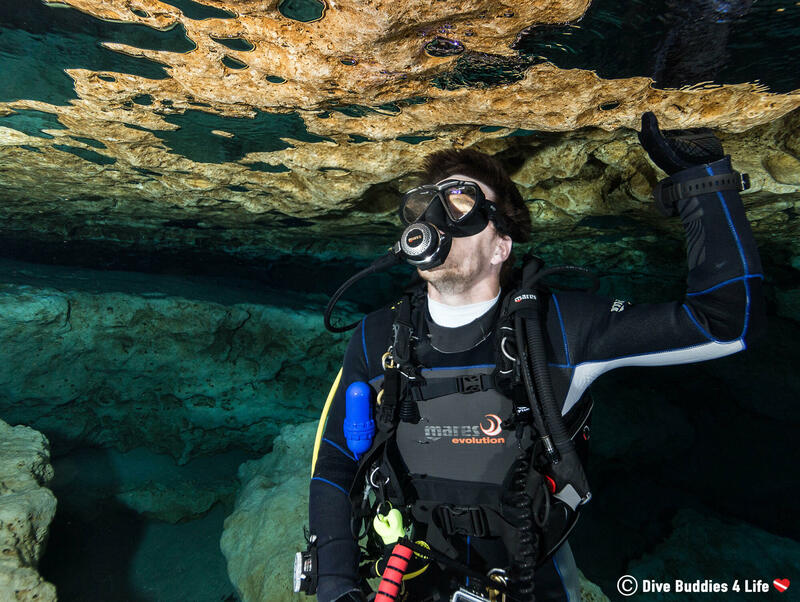 Cost: The price to dive Ginnie Springs costs 22.00 USD for certified cave divers and 30.00 USD for all other divers. On top of this, if you want to rent equipment (either individual pieces or a whole set), the website has a comprehensive list of everything with each associated cost. If you arrive with your own scuba cylinder (make sure your tank has an updated visual and hydro), you can purchase fill tokens at the store counter for about 5.00 USD and hand them in at the fill station. 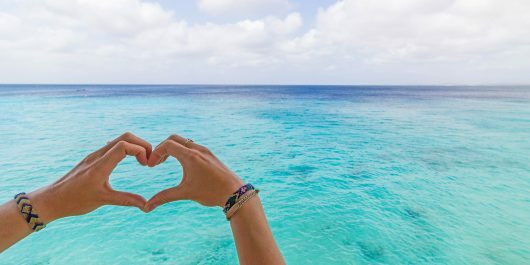 Seasonality: Rejoice divers! 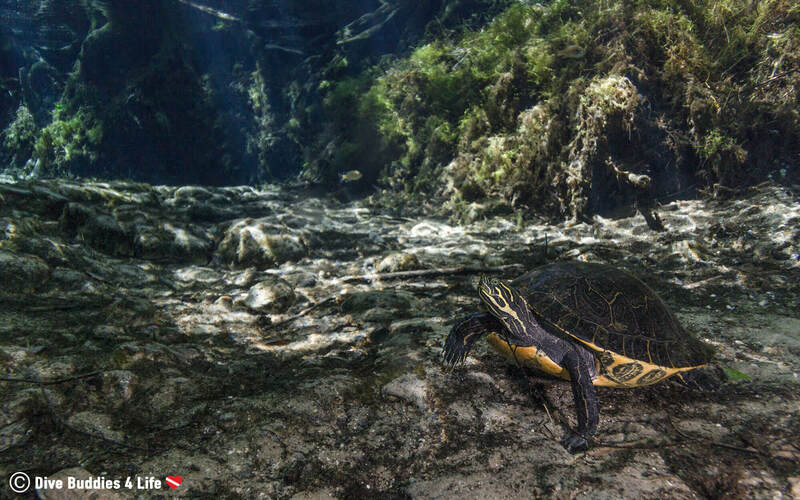 You don’t need to pick a specific time to head to this section of Florida because Ginnie Springs Outdoors is open all year round and because you are diving in spring water the temperature and visibility are pretty consistent. 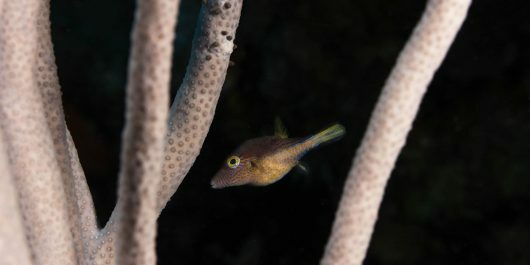 Make sure to check the website before planning your dive vacation. As a general rule of thumb, the park opens at 8 AM every day and closes ½ hour before sunset. In the summer Monday-Thursday, the hours are 8 AM – 7 PM, Friday – Saturday 8 AM – 10 PM and Sunday 8 AM – 8 PM. In the winter, hours are 8 AM – 4 PM Monday to Thursday, 8 AM – 8 PM Friday and Saturday and 8 AM – 6 PM on Sunday. 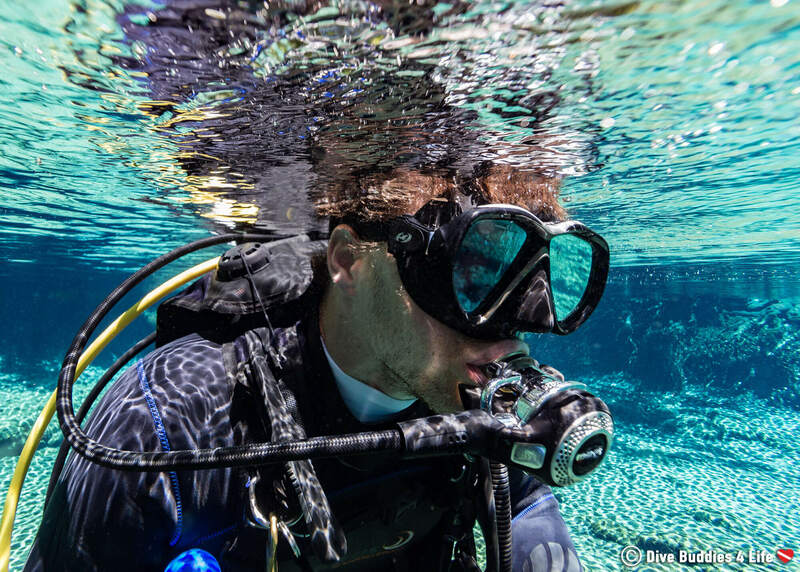 Restrictions: As per the diving standard, upon entering Ginnie Springs Outdoors, you will need to show your certification card, pay the fees and fill out a liability waiver. Unfortunately, if you are less than 12 years old, regardless of your certification level, you are not permitted to dive. 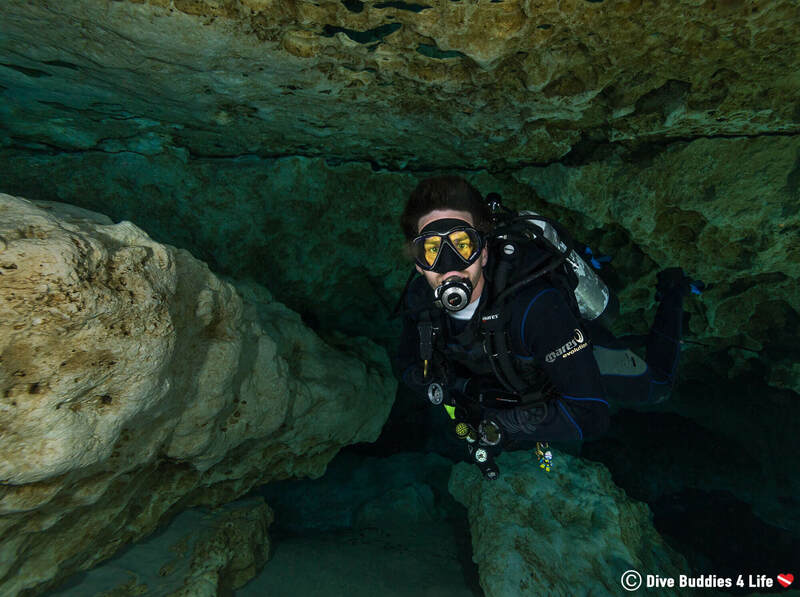 In addition to these restrictions, it is also important to note that anyone without their cave diving certification will not be permitted to bring lights of any kind into the Devil’s Spring System dive site. 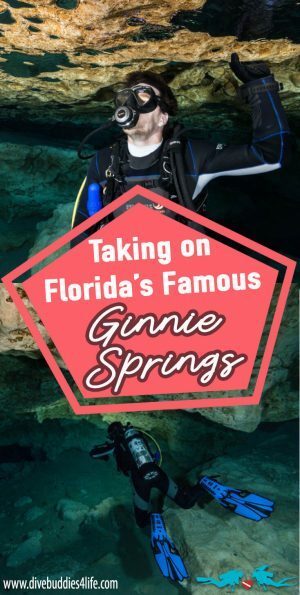 Companies: Onsite at Ginnie Springs, there is only one dive outfitter from which you can get air fills and rent equipment, Ginnie Springs Outdoors. That is who we used, and while we can’t speak for equipment rental as we had our own, we were VERY pleased with the air fill price. 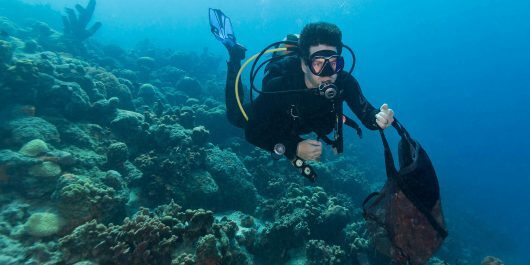 If you are looking for another dive supplier, there are other scuba suppliers a short drive away. 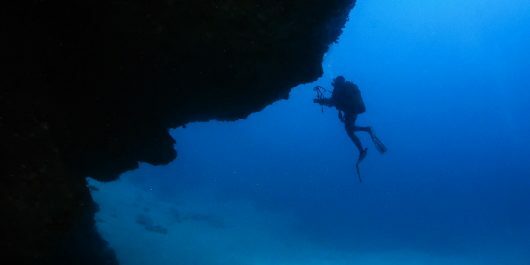 Scuba diving is an amazing sport where we can go deep underwater and see an amazing nature. I love how you capture this in a post!